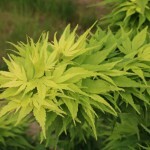 A dwarf selection of Japanese Maple with foliage that emerges light green in the spring, maturing to medium green. The foliage has long narrow lobes that overlap like shingles on the short stems, almost in clumps or tufts. The fall color is yellow to orange. It prefers sun to partial shade and a well-drained soil. It is frequently used for bonsai. The fall color is yellow to orange. It prefers sun to partial shade and a well-drained soil. It is frequently used for bonsai.